So besides that song from the Sound of Music running through my head, are you humming it too? Here are a few of my favorite things. First, there’s chocolate. Really chocolate in any form makes me happy. I love eating it whether its chocolate mousse, chocolate cake, or chocolate candy. As a result I find true strength isn’t being able to break a chocolate bar into 4 parts, but being able to break it apart, eat one piece and walk away from the rest. Tidy data is next on my list. I know it sounds crazy but I have, during my marketing career, been responsible for building and cleaning up databases. The ones I like the best, that always make me smile indulgently, are those dirty databases, no NCOA, no de-duping, names and addresses filled with errors that I have successfully fixed. When data is tidy, the sales results can’t help but make everyone smile. Last on today's list is good friends. These are the friends that you can say anything to and they don’t judge you, they just take it in. They may be friends that you don't see for a long time, I mean years, and yet when you get together it is like no time has past at all. I only have a few of these special friends and I treasure each one. So when I'm challenged by my job search, or my family or the balance in my check book, and feel down in the dumps, I simply remember, ... well, you know the drill, "when you get down to the bottom of the barrel, you just float back on top!" Dedicated to Leslie, Rick, Sarah, Bill, Heather, Joan and my girls! Oh My, Marketing Has Changed! It was a box too long, shallow, and heavy to carry easily and I was reverently attempting to deliver it safely across campus. Reverently because it contained the several hundred punch cards I had keyed. It was 1972 in Illinois where they have fields of sunflowers, all you can see for as far as you can see. Pure magic. I believe in magic but I also believe in finding it in results. So I was negotiating my way towards the computer building. I had an appointment to discover what these cards would reveal about the communication proclivities of the college students who had completed my master’s thesis questionnaire. It was a walk that became my journey; a lifetime of trying to get people to react, do, and buy what I wanted when I wanted. Sounds presumptuous, doesn’t it? I did/do mean well. I have this fantasy of being able to make the “world” better. That communication brings understanding. So no surprise, my calling is marketing and I’ve been making that trip between the communications building and the computer lab for about 35 years (ouch). What I’ve learned is that marketing projects almost always require IT support, an experience that is like bringing together, without an interpreter, tourists who speak different languages. There is lots of hand gesturing and head-shaking. My own attempts translate into: I know enough about technology to get myself into trouble. On the job, working with what seems to be always outdated database management systems, struggling with not enough IT resources, getting a vision of what might be and then trying to enlist people in different areas and other companies, to make the idea a reality. Being told “No, it can’t be done”, never really understanding why, secretly believing there’s a lie involved. Working in direct response marketing, I’ve learned how to build databases, test creative concepts, offers, and customer segments. I’ve even led a team to develop programming and launch a product that was scanned and activated at the cash register. With the development of social media channels, I’ve recognize the opportunity to engage customers in new ways. I also discovered that in this online arena, much of my direct response experience is helpful. For example landing page A/B testing, pay per clicks, Google analytics, these are all focused on measuring and interpreting response. It seems that “measurable” marketing is now all the rage. The sum of my intentions is this: that as well as I know direct response marketing, the lands of information science are on the outskirts of my maps and there’s this warning: Beyond Here, Be Dragons. But I’m not easily deterred. I see a growing need for marketing managers, like myself, to bring high competency in technology to their strategic marketing work. I want to be that marketing expert that can meld these two disciplines, marketing and technology, into a seamless communication solution; a solution that delights and then motivates the consumer. Can you help me? Postscript: I've been accepted at Penn State and I'm now getting my Masters in Information Science. I'm excited to be on this journey. Fortune Tellers, New Improved or A QR Code Primer! Remember recess in the schoolyard during your grade school days and those paper fortune tellers? The kid holding the fortune teller would ask a series of questions, you'd pick certain numbers or colors? All of this would lead delightfully to some type of revelation about your love life or how you were going to do on that history quiz. 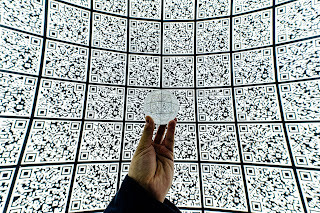 Now there's a new improved version in town and it's called a QR code. QR is short for Quick Response because these codes can be read quickly by a cell phone, a smart cell phone that is, and give you access to detailed information. Although it might not tell you the outcome of your history quiz, it can be configured to take you to chapter highlights. You've probably seen these intricately marked squares (look right to see one I created) and wondered what they are. Basically, QR codes are a special type of bar code. They are a mobile tagging device that can store much more data than a standard bar code including url links, geo coordinates, text, really any kind of information that can be stored digitally on the Internet. They make everything interactive so you'll see them being used in stores next to merchandise, on business cards where contact information magically downloads, on posters detailing event information or billboards where they reveal a secret, on T-shirts perhaps expanding on a theme or even on TV. It all started in Japan where QR codes were created for use in vehicle manufacturing and gained rapid adoption and then broke into Europe. They are gaining popularity in the US as we too become a nation of smartphone users. According to a Nielsen study, 50% of US mobile subscribers (or 142.8 million people) will be smartphone owners this year. If you're one of these lucky smartphone users, you can download the QR code reader app (from a site like Kaywa or ScanLife) and start scanning. And you should because these mysterious Rorschach squares can transport you to all types of information including coupons, product information, event details, an explanatory YouTube video, Facebook fan page, or even your daily horoscope. So you will be able to find out about your love life after all! Bottom line, a QR code is a consumer portal to more information so the advertising can stay succinct while the offer details if you're curious, are easily accessible. 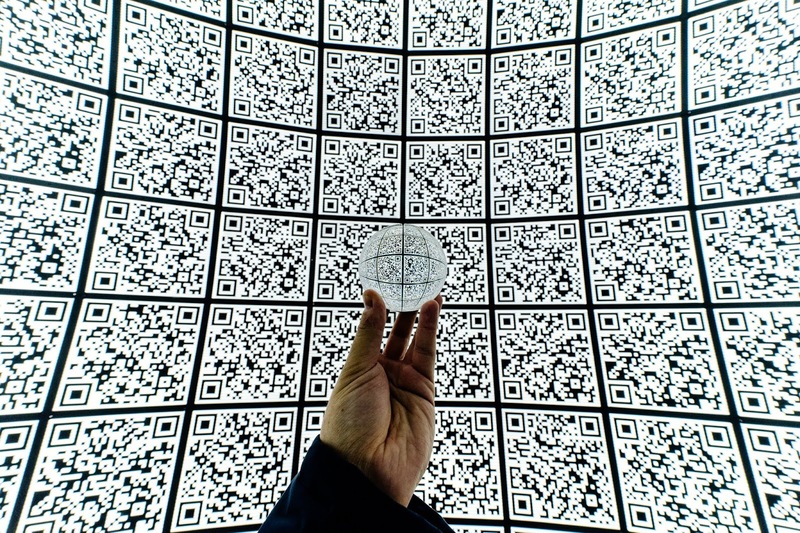 June 11, 2011 - Addendum: Here's a great article from a source I trust on Why Marketers Shouldn't Waste Their Time with QR codes but I still think they have a place plus they're fun. So What's Fido Getting for Valentine's Day? Valentine’s Day isn’t just about sharing the love. It’s one of the major spending holidays in the US and an indicator for economic growth and consumer trends. So I was interested to see a survey published by the National Retail Federation (NRF) that showed that since 2007, the last pre-recessionary year, US retail spending habits for Valentine’s Day have changed. In particular, there’s a definite upward trend in folks spending on gifts for their pets. There are also more dollars being spent on jewelry which I hope means that the “bling” you just purchased is for me and not for Spot. The NRF’s 2011 Valentine’s Day Consumer Intentions and Actions Survey also found that candy and apparel sales should all provide a winter time boost for retailers. In fact the overall forecast for the total 2011 Valentine’s Day spending is $15.7 billion. This is an increase of about 11% over 2010’s forecast of $14.1 billion but still below 2008’s of $17.0 billion. But what about cards you ask? After all, Valentine’s Day is the second-biggest card-giving holiday in the US. As it turns out, according to the NRF’s survey, greeting cards continue to be the most popular gift option at 52.1%. However, in 2009 Experian Simmons reported that eCards were just as popular as the traditional paper ones. And I imagine that eCard popularity has increased in the last two years along with the adoption of mobile phones. So I’m betting that this year eCards will probably surpass the traditional ones. On flowers, the Experian research found that younger and older consumers are most likely to give flowers evidently because they can’t think of another present. This could mean that flowers are either a last-minute gift choice, or that consumers think flowers are appropriate for any occasion which is of course, what florists have been telling us for years. As usual, men are projected to spend the most on Valentine’s Day gifts. In the NRF’s survey, men said that they plan to shell out twice as much as women, ($159 versus $76). But remember this is “self-reported” and in my experience a loved one’s perception and their reality often prove to be two entirely different things. No matter, give a kiss anyway and you have a great February 14th. As for me, I’m off to buy a nice celebratory chewy for Mellow or maybe I should get her that double-fleece night reflective doggy coat! See also Mashable's Post, Social Networking Americans' Valentine's Day Plans! This video is part of the fascinating digital ethnography program at Kansas State University directed by Dr. Michael Wesch.